PLEASE BE ADVISED WE ONLY HAVE SATURDAY-SATURDAY RENTALS FROM MEMORIAL DAY TO LABOR DAY. Our beautiful home has everything to offer within a short walk to the beach and was recently seen on HGTV. It is perfect for families, friends or golf/tennis groups. One of the best features is a wonderful deck, perfect for sitting and relaxing or grilling up some dinner. Our new large spa/pool (heated upon request) includes 2 waterfalls and variable colored lighting that will create a fun light show. Walk down to the lake and enjoy fishing, reading or watching the turtles on our private dock. With an open floor plan, our home features a great room with a 42” HDTV, comfortable furniture and a superb view of the pool and lake. For the chefs, we have a gourmet kitchen with easy access to the large deck. Our house features hardwood floors and an advanced lighting system. Three of our bedrooms have king beds with double sinks in the baths. These bedrooms face the lake with a wonderful sunrise view. The 4th bedroom has a private bath and queen size bed. Relax & enjoy the features of our Hi-tech home: Our Hi-tech home has wireless internet to keep you in touch. If you just want to get away, come in and relax in our ground floor great room with its lovely view of the lake and pool and HDTV. You can also enjoy yourself upstairs in the media/game room. Play bumper pool or cards while you watch a movie on the 42” Plasma TV & DVD player with surround sound. Kids of all ages can enjoy playing Wii. Our home has “built in” speakers throughout the house and on the deck. Bring your own CDs or enjoy our collection of music while relaxing by the pool or whipping up dinner in the kitchen. If you need quiet time, we have puzzles, games and a small library for your enjoyment. Features of our gourmet kitchen: Our gourmet kitchen is fully equipped with stainless steel appliances including a 5-burner stovetop, double oven, 2 sinks, and microwave. We hope that you will enjoy cooking up meals with our upgraded pans and full complement of cooking accessories. Whether in the kitchen or outside on the grill, you will have what you need to make a great meal. We have a full set of indoor and outdoor dishes/glassware for your enjoyment. For the wine drinkers, use our wine cooler to keep your beverages at the perfect temperature or cool them down with our portable wine chiller. Our kitchen is equipped with everything from a casserole dish to a smoothie maker. We hope you enjoy! Whether golfing, swimming, biking or reading on the beach, our family loves to spend time in beautiful Hilton Head. We found our house in 2008 and knew that it would be a great place to share with our family and friends. We hope that everyone enjoys their visit as much as we do!! The Novak family has created a wonderful vacation home for others to enjoy. It is very well appointed. We enjoyed the pool and hot tub. Close to the beach. Thank you for the review. We try very hard to provide a clean home and a relaxing place for your vacation. The house was lovely. The view of the backyard was incredible and we saw an alligator, egrets, and turtles. The house has the best stocked kitchen I have seen in a rental home. The appliances were all top notch and I especially enjoyed the double oven. If you enjoy cooking, look no further. This house is for you. This was our family’s first winter beach trip and it was fantastic. Nothing was crowded but everything was open. Check-in was easy and Rosina responds very quickly to questions. Tip: Check out Jarvis Creek Park if you want to see lots of birds and alligators. This house was perfect for our family to spend time together. My husband and I along with our two grown children and their young families and my mother! The kitchen is great and fully equipped for anything you want to cook. I loved the fact that they also had a high chair and pack n play for our grandchildren. Very relaxing and the lake was a big hit with our 2 grandsons as they loved watching the turtles and alligators! Thank you Novak's for sharing your beautiful home! We are so glad you enjoyed your stay. Please think of us when you come back to HHI. This was the most beautiful and well kept vacation home we have ever stayed at! Overlooks a lagoon in a private setting and provides a very relaxing experience. Home was clean, beds very comfortable, gorgeous interior, and kitchen well stocked. Home is a short 5-10 minute walk to the beach. We definitely want to come again!! 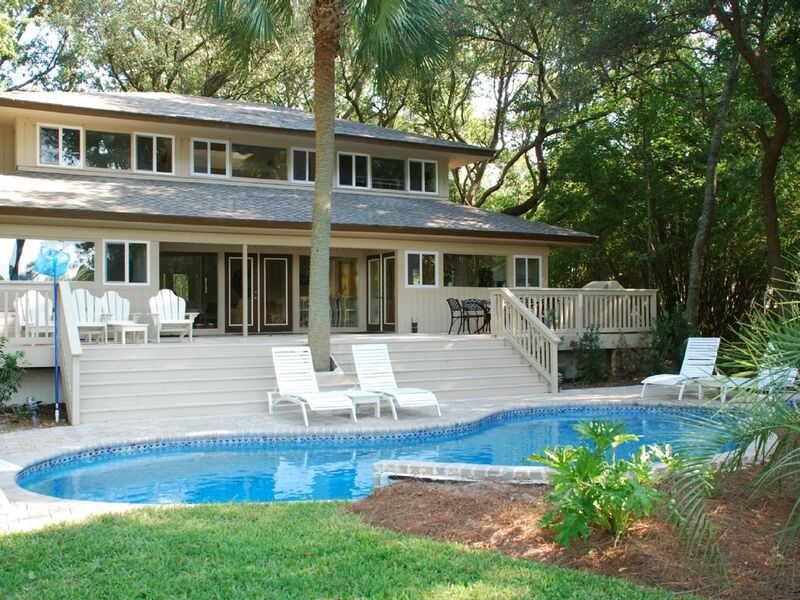 Our luxurious home is located in the lovely beachside community of Palmetto Dunes in Hilton Head, SC. We have 3 award winning golf courses in PD as well as numerous courses within a short drive. First class tennis instruction and indoor/outdoor court are a short walk way. A free 'on-demand' shuttle is available to transport your throughout the community. Palmetto Dunes has miles of beautiful beaches for your enjoyment. Hilton Head also offers outlet shopping, theater, mini-golf, deep sea fishing, dolphin watching and much more. We are located around the corner from multiple outstanding restaurants. Additional charge for heating the pool. Please contact owner for pricing.